The Mini-League is a great way to get involved in competitive singles play at the Club. The competition consists of a number of mixed male and female Divisions (depending on how many people are in the League it can be up to 25 Divisions) where each person plays everyone else in their Division in a best-of-11-games Singles match with the total number of games won scored to create a league table. We run the competition throughout the year with promotions and demotions as each round ends. 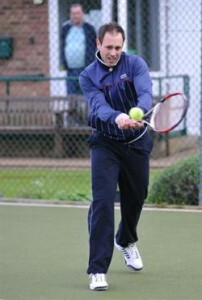 The Mini-League is organised to promote competitive singles play within the club for all standards. They are open to all members (including juniors recommended by their coach). People wishing to join the leagues should seek advice from a coach or existing member of the league as to which would be the most appropriate division to join in. They should then write their contact details, this division and the name of the person referring them on the joining sheet. This process simply helps ensure that players do not join at too low or too high a division and improves enjoyment of the league for everyone. Alternatively, contact the administrator by email. There are, of course, Rules! to see what they are, read the small print here.